Following sea trials last week, the new aquaculture multi-role workboat, the Meercat M15, has been handed over to her new owner, the Scottish Salmon Company. 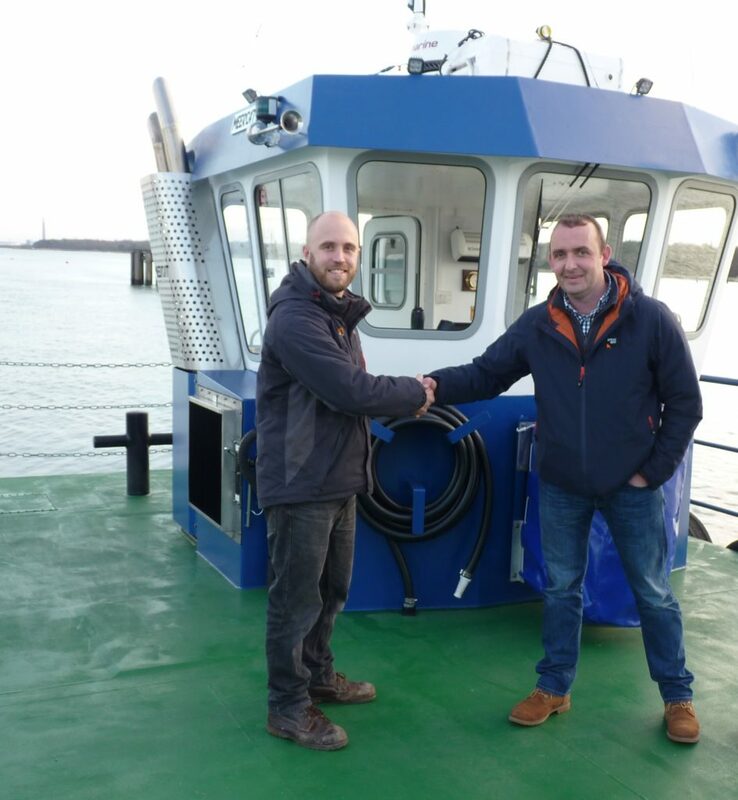 Robert Currie, Marine Sites Manager of the Scottish Salmon Company received the keys from Jim Mair, Meercat Boats’ Manager. The new M15 has now left the Meercat Boats’ build facility in the Port of Southampton and is now steaming her way to her new home in the Western Isles, where she will undertake a mixture of aquaculture management support and fish farm servicing operations. Aquaculture plays an important role in the livelihoods of many based in the Western Isles and as such, Scottish Salmon held a naming competition to the local schools to find a suitable name for the vessel, all to be revealed soon. The Scottish Salmon Co has been involved in the design and planning of the M15 since day one, to ensure the vessel is precisely built to their requirements, with additional fixtures and equipment. Like the majority of vessels built by Meercat Boats, each one can be built and set up for specific operations as required by the owners and operators up to 24 metres in length. The M15 will arrive in Scotland in the next few days and will immediately be put to work. We wish the new owners happiness and longevity with their new purchase. Call the Meercat team today to discuss how a Meercat multi-role workboat can enhance your business.